What makes the left left and the right right., page 1 enis you use the mens restroom. I think gay people are completely normal and just like everyone else. I am pro gun, pro choice, pro legal immigration, pro freedom, pro legalization of marijuana, anti-universal healthcare....I am not sure WHAT I am to be honest. Lmao my sentiments exactly. I think that might be the Allure of Trump to us. I'm not sure, but i think if you have opinions about anything, you're a Fascist Nazi. I want the government mostly out of my life. I think it exists to protect inalienable rights (like the right to life which means I tend to be pro-life/pro-responsibility) but not to save you from yourself - so sure I'm not against the theory of legal drugs so long as you can't reach into my pocket to enable your bad habits if they get out of your control. I don't think the government exists as a cudgel to force my charity by taking from me to distribute as it sees fit. I think of someone on the left as someone who feels like government exists to do for them where they don't want to do for themselves - pay for their health care, pay for their college, pay for most anything really. And that comes at my expense. There is only one person on ATS who knows what left wing is. He can be found scooping communist ales and ignoring barbers every single day. Forget the fact that some grew up in the militant fields of Liverpool in the 80's,Derek Hatton's playground. I think the left/right paradigm as a lot of people think about things is based off of their own concepts of right/wrong, projection and self-identification (even if they are wrong). 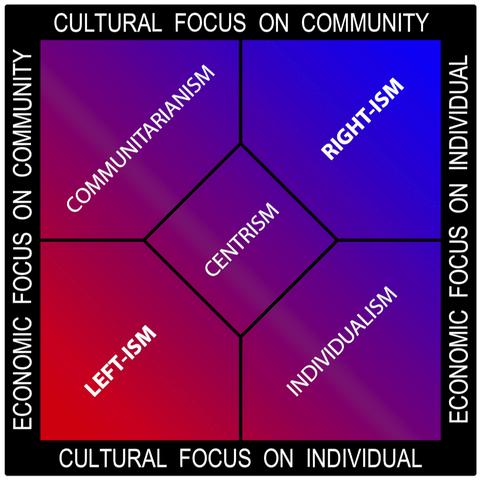 But there is the political compass to keep in mind when thinking about these things. There are a lot of variations of these things with varying degrees of slant. The whole concept does generalize a lot and it's easy for people to try to shoehorn others into fitting their projected concepts but it can help to get a 'quick and dirty' feel for someone's ideologies. The extremist angles are pretty much go far enough one way or the other and you end up an anarchist or a totalitarian. It's a deep subject and I probably don't do it justice here. edit on 20-11-2017 by Noncents because: Correction! For how well can a bird fly with one wing? When 1 observes some Americans stuck on side picking and still hating on Americans? totally missing the chess game, I wonder do they really understand what America stands for or is there some underlying appreciation for ignorance being used to manipulate and fuel the "distraction? Causing them to forget what it stands for.